Dyfed (Devet) : 22 certain stones (BRAW1/1, BRAW3/1, BRIDL/1, CALDY/1, CDWYR/1, CILGN/1, CLYDI/1, CLYDI/3, EGLWC/1, JRDNS/1, LDEIL/1, LDWKE/1, LFRN2/1, LGELR/1, LWNIO/1, MTHRY/1, NEVRN/1, NEVRN/2, RHDDL/1, SDOGM/1, SDOGW/1, STNTN/1) and 3 doubtful stones (HENLL/1, LDYSL/1, SPTTL/1). Ceredigion (Cereticiaun) : 1 doubtful stone (LARTH/1). Brycheiniog (Brecheniauc) : 8 certain stones (ABHYD/1, CRAI/1, CRCKH/1, DFYNG/1, PONTS/1, TCSTL/1, TRLLW/1, YFLL2/1) and 3 doubtful stones (TIRPH/1, Maen Llia, Llanfihangel-Cwmdu). Gwynedd (Guined) : 3 certain stones (BRYNK/1, CLOCG/1, LFAEL/1) and 2 doubtful stones (PTREF/1, TFLYS/1). 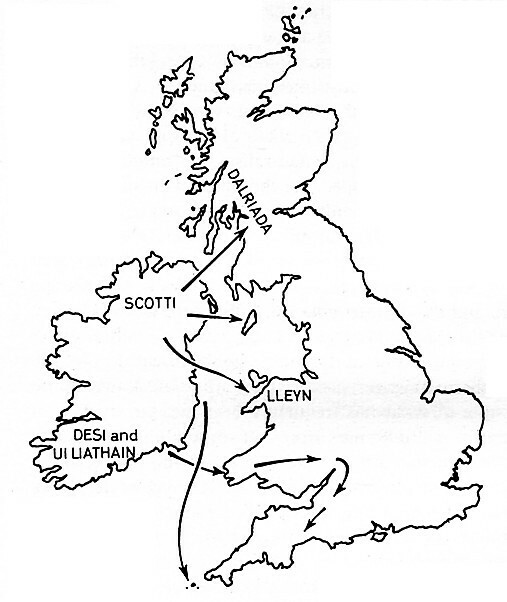 The distribution of Ogham stones in Wales closely reflects the geopolitical situation of post-Roman Britain. 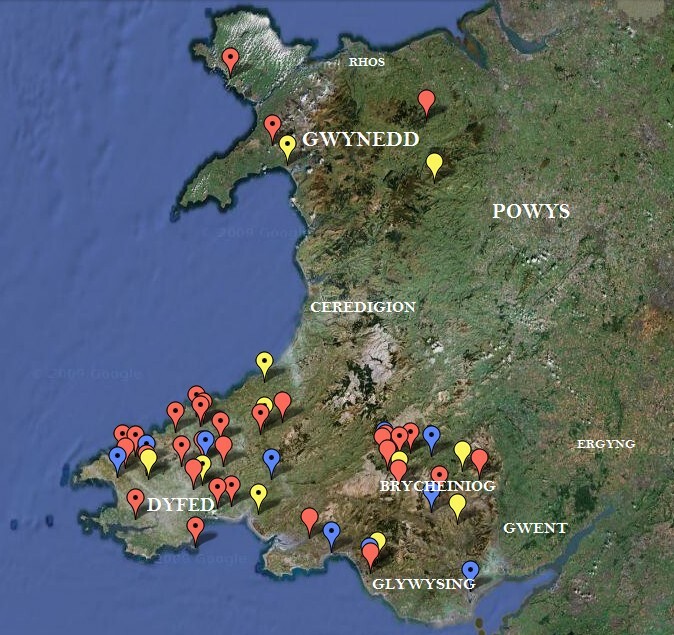 The majority of stones are concentrated in the area of south-west Wales that belonged to the Kingdom of Dyfed (early 5th century through to the early 10th century), which was the major centre for Irish settlement in Wales during the post-Roman period. During the late 4th century and early 5th century large numbers of the Déisi crossed from the Waterford area of Ireland to Britain, and settled in the land of the Demetae in south-west Wales. Their leaders displaced the original British ruling class, and founded the kingdom of Dyfed, which is believed to have been bounded on the north by the River Teifi and on the east by the River Tywi. Dyfed was neighboured on the north by the Brythonic Kingdom of Ceredigion, and to the south-east by the Brythonic Kingdom of Glywysing, but to the east lay the Kingdom of Brycheiniog (largely corresponding to the area of modern Brecknockshire), which had also been founded by Irish raiders, and was ruled by kings of Irish descent. Over twenty Ogham stones are found within the territory of Dyfed, including a couple of stones which are just on the other side of the River Teifi, in erstwhile Cardiganshire (RHDDL/1 and LDYSL/1), but the modern course of the river clearly deviates from the course the river took fifteen hundred years ago, and they would originally have been on the Dyfed side of the river. At least eight Ogham stones are also found in the territory of Brycheiniog, testifying to the strength of Irish settlement in these two areas, and evidence that the Irish language was widely spoken here, at least by the ruling elite and land owners. There are also two Ogham stones east of the River Tywi, in what would probably have been the territory of Glywysing, suggesting that Irish settlement pushed eastwards from Dyfed into the western part of its Brythonic neighbour. To the north of Dyfed, in the territory of Ceredigion there is only one doubtful Ogham stone (LARTH/1). 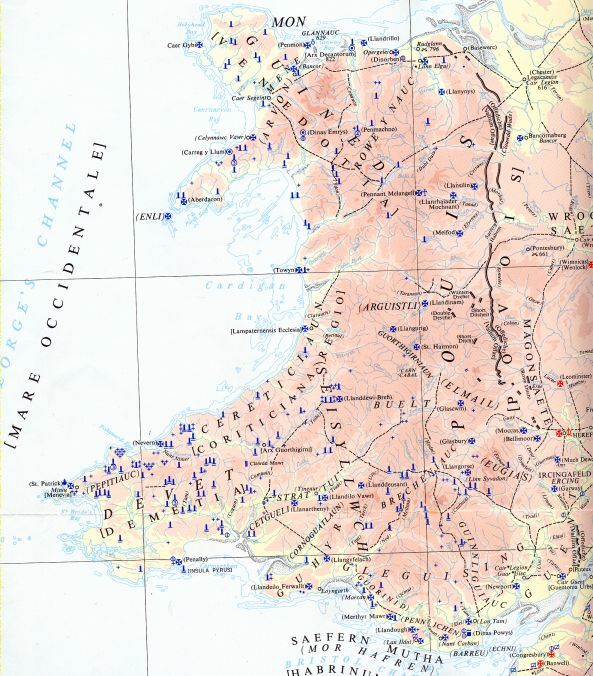 In contrast to the large number of Ogham stones in South Wales (at least 32), there are only three certain Ogham inscriptions in North Wales, all within the territory of the Kingdom of Gwynedd. 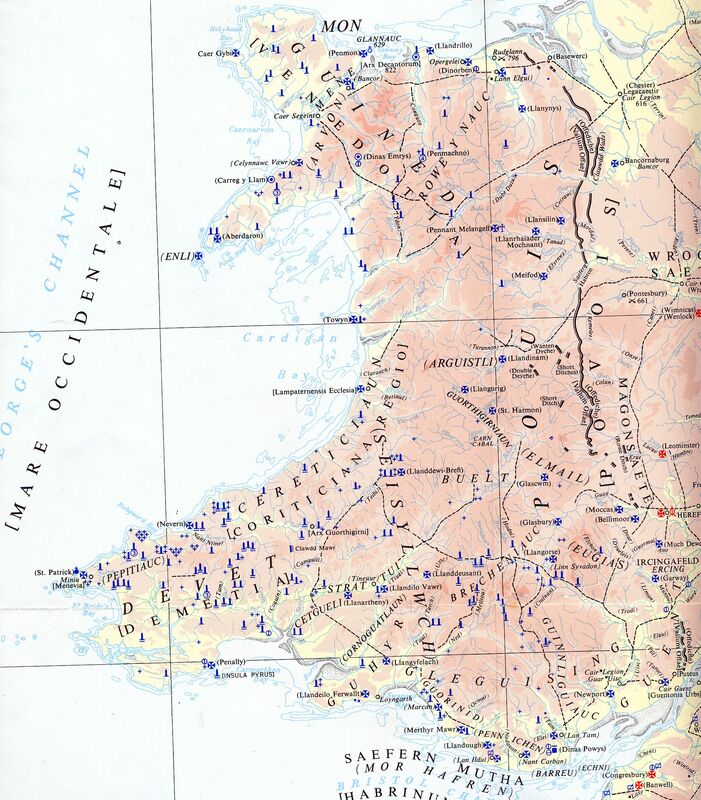 There had been extensive Irish raiding and settlement in the north of Wales as well as in the south, especially in the Llŷn Peninsula (the name of which is derived from the Laigin, the men of Leinster) and Anglesey, but during the late 4th century and early 5th century there was strong resistence to the Irish incursions, led by Cunedda (founder of the kingdom of Gwynedd), and the Irish did not manage to gain control of any of the kingdoms in the north. 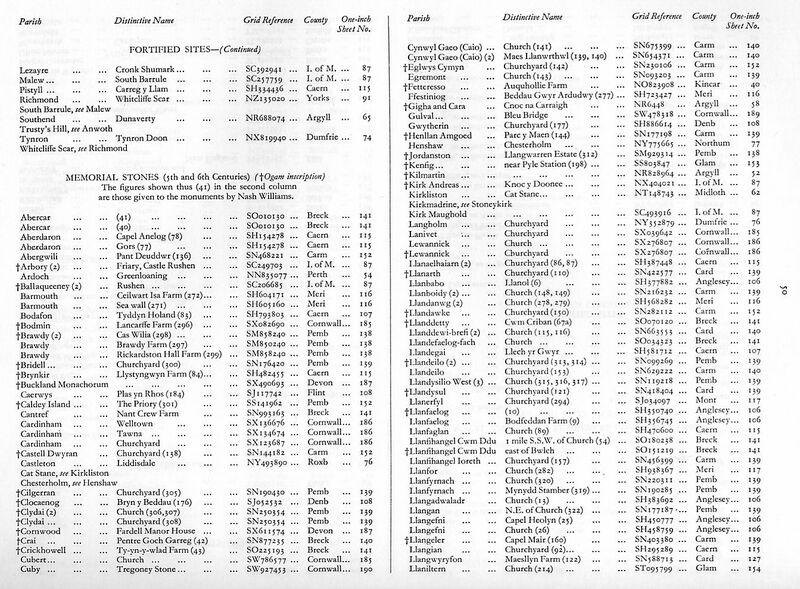 So it is perhaps to be expected that there are a few Ogham stones in the area of Gwynedd, but not very many, reflecting the presence, but not dominance, of Irish settlers in the region. The Ordnance Survey Map of Britain in the Dark Ages (first published 1935) gives a very useful overview of the archaeological remains in Britain during the period 410–871, and comes with indexes which give the exact location of each feature marked on the map. 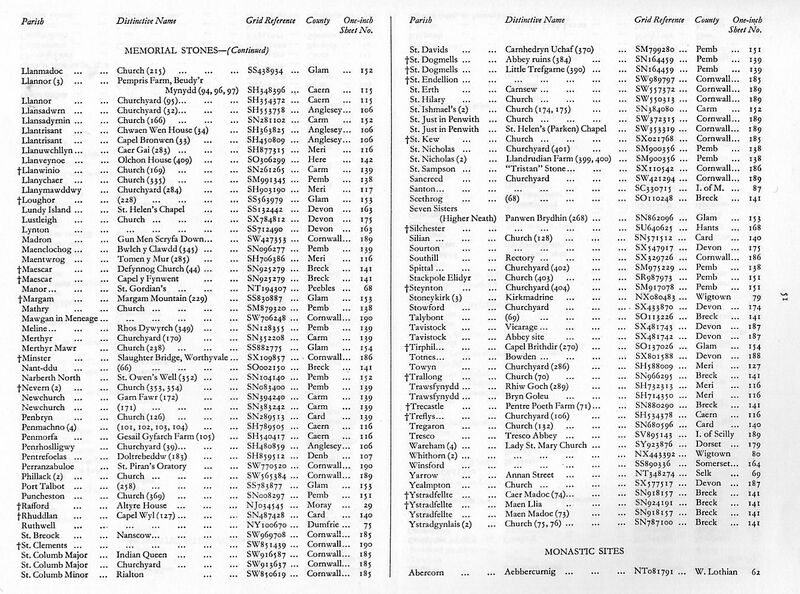 In the case of Celtic memorial stones (with or without Ogham inscriptions), where possible the index on pages 50 and 51 provides a reference to Nash-Williams' The Early Christian Monuments of Wales (Cardiff, 1950), from which it is possible to identify the stone in question in the CISP database. Up until a few days ago I had assumed that these must all have been accidentally mislabelled by the editors of the map, and that they were almost certainly without any Ogham inscription. However, on Monday I noticed on the page describing the forthcoming third volume of A Corpus of Early Medieval Inscribed Stones and Stone Sculpture in Wales the statement that "[d]iscoveries made in the course of fieldwork in 2007 include a previously unknown ogam inscription on a roman-letter inscribed stone from Llanfaelog". Upon enquiry, Professor Nancy Edwards was kind enough to provide me with the details of this discovery, and it transpires that the Ogham inscription is on the stone indicated as having an Ogham inscription on it in the index of memorial stones in the Map of Britain in the Dark Ages (cross-referenced to ECMW 10, the Mailisi stone). This stone and its Latin inscription, M‍AILISI, was first noticed by John Skinner in 1802 (Ten Days Tour through the island of Anglesea page 42 and 48; in Archaeologia Cambrensis Supplement, July 1908), when it was already in use as a lintel in a barn, and it remained built into the barn wall until the barn was demolished in 2001. Skinner only notes a Latin inscription, and I can find no mention of an Ogham inscription on this stone in any source other than the Ordnance Survey map. Moreover, according to Professor Edwards the Ogham inscription was not visible until the stone had been removed from the structure of the barn in 2001, so where, I wonder, did the Ordnance Survey get the idea that the stone did have an Ogham inscription on it ? Perhaps it is just a lucky coincidence that they accidentally mismarked the Mailisi stone as an Ogham stone, but given that there are nearly fifty memorial stones in North Wales, and only two of them (other than this stone) definitely have an Ogham inscription, it would be remarkably serendipitous to make such a mistake on the one stone that really does have an Ogham inscription amongst all the others that do not. I wonder if perhaps at one time the Ogham inscription was visible, and had been noticed by an Ordnance Survey surveyor, but later became obscured when the window it was a lintel to was perhaps rebuilt, and so the Ogham inscription was not noticed by Nash-Williams. Whatever the true explanation may be, it has made me think again about the other four stones in Wales and Cornwall that only the Ordnance Survey map indicates as having an Ogham inscription on them. Does the Ordnance Survey perhaps know something about these stones that Macalister, Nash-Williams and everyone else did not know ? A further issue with the Ordnance Survey map (and also with the Wikipedia map) is that some of the stones indicated as having an Ogham inscription may not really have an Ogham inscription on them at all. Because of the nature of the Ogham script and the way that it is carved along edge of stones, Ogham inscriptions tend to be less durable than Latin inscriptions. Over the centuries the edges of a stone can become abraded, and the strokes of Ogham letters (especially the vowel letters) can disappear. The result of this is that most Ogham inscriptions are incomplete, and need to be reconstructed to a certain extent. This also means that ogamologists need to be on the look out for odd incisions and marks on the edges of stones that might be the vestiges of an Ogham inscription that has been all but worn away. Unfortunately, this also means that natural features of the rock or marks made by later processes (such as sharpening farm implements or weapons) may be mistaken for the remnant strokes of Ogham letters. It is also possible that Ogham inscriptions were deliberately obliterated at a later date, usually when a cross was added to the stone, either because they were thought to be pagan marks or because they were aesthetically displeasing. R. A. S. Macalister, author of the monumental Corpus Inscriptionum Insularum Celticarum [CIIC], had a particularly fanciful imagination when it came to recognising remnants of Ogham inscriptions. Macalister identifies LARTH/1 (CIIC 348), LDYSL/1 (CIIC 349), SISHM/1 (CIIC 376), HENLL/1 (CIIC 364), PTREF/1 (CIIC 401) and TIRPH/1 (CIIC 404) in Wales, and SENDL/1 (CIIC 478) and SCLEM/1 (CIIC 473) in Cornwall, as having traces of an Ogham inscription on them. In a couple of cases there is no visible trace of any Ogham letters left on the stone, but Macalister speculates that a perceived pattern of flaking along the edges indicate that an original Ogham inscription has been deliberately obliterated. Macalister is the only authority to see the remnants of an Ogham inscription on most of these eight stones, and for some of these stones other authorities have explicitly discounted the possibility of an Ogham inscription. Thus, it is doubtful that these stones did originally have an Ogham inscription on them, but because they have been identified as having one by Macalister, they are still marked as such on the Ordnance Survey and Wikipedia maps. I have attempted to distinguish between certain Ogham inscriptions (including stones such as DFYNG/1 and MTHRY/1 that have vestiges of an Ogham inscription that are recognised by more than one authority) and doubtful Ogham inscriptions on my map, by marking certain Ogham stones with a red tag (35 stones), and marking doubtful and unconfirmed Ogham stones with a yellow tag (11 stones). The Welsh Ogham stones are all dated to the 5th and 6th centuries, and as is the case with the Ogham stones of Cornwall and Devon, most of them have a dual inscription, in Latin (script and language) on the face of the stone, and and in Ogham/Irish on the edge of the stone. Of the 35 definite Ogham stones in Wales, only five do not have a corresponding latin inscription (BRAW1/1, BRIDL/1, LFRN2/1, LOUGH/1, YFLL2/1). In all cases the inscription records the name of a person, and optionally the name of the person's father or some other familial relationship. In almost all cases the commemorated person is male, but in one case the Ogham inscription refers to the commemorated person as the daughter of someone (EGLWC/1). Seven of the Latin inscriptions on biscript stones incorporate the hic iacit "here lies" formula, and a little over half of the definite Ogham stones are sited in churchyards or in churches, so it seems probable that most of the stones were memorial stones or grave markers (although none have been archaeologically associated with a grave). Two stones from Brawdy, one Ogham only (BRAW1/1) and one Ogham and Latin (BRAW3/1), were found next to an Iron Age hill fort (they were being used as a footbridge and as a gatepost, so they may well have been moved from an original location inside the hill fort). It has been suggested that the hill fort may have been reused as burial site, as was the case with some other hill forts in south-west Wales during the early medieval period, which would explain the presence of two Ogham stones in the same location (see Nancy Edwards, Early-Medieval Inscribed Stones and Stone Sculpture in Wales: Context and Function page 22). Another stone (CLOCG/1) originally stood on the summit of a burial mound called Bryn-y-Beddau "Hill of the Graves", in the close viscinity of a number of stone circles. Two stones originally stood close to Roman roads : the memorial to Icorix (BRYNK/1) was 200 m. from the road to Caernarfon and 300 m. from a minor Roman fort; and the memorial to Voteporix the Protector (CDWYR/1) was found at the edge of a churchyard about 200 m. south of a Roman road. The siting of these two memorial stones may reflect a continuation of the Roman custom of roadside burial, or may simply thave been intended to let the memorial be seen by people travelling along the road. Although most stones were probably memorials to the dead, there are also a few stones that are sited on open moorland (YFLL2/1) or in mountainous countryside (PONTS/1) that are nowhere near ecclesiastical or burial sites, and so may have been used as markers of land ownership, as was probably the original purpose of Ogham stones in Ireland. In comparison with Cornwall and Devon, where three of the six definite Ogham inscriptions that we can read commemorate people with Latin names (Ingenuus, Iustus and Latinus), only four out of the thirty-five definite Ogham inscriptions in Wales commemorate someone with a Latin name. This difference is probably due to the relatively small number of Irish settlers in Dumnonia becoming culturally assimilated within the Romano-British population; whereas the Irish settlers in Wales belonged to large Irish communities, and so there was no pressure on them to adopt Latin names in favour of Irish names. The CRCKH/1 and KENFG/1 inscriptions both illustrate the use of the rare Ogham letter Ifin or Iphin (earlier Pin, from Latin pinus "pine" or spina "thorn" ?) ᚘ (in manuscript texts written as two overlapping diagonal crosses, but in monumental inscriptions written as a single diagonal cross) that is used to represent /p/ in Latin, Brythonic or Pictish names. As Primitive Irish did not have a /p/ sound there was originally no Ogham letter for /p/, and so the cross-shaped letter was added to represent this foreign sound. In later medieval Irish tradition this letter was repurposed as the diphthong /io/, and a new letter Peith ᚚ introduced to represent /p/ in its place. The only other definite occurence of this letter on an Ogham stone inscription is in County Kerry, Ireland (COOLE/1), where it is used to write the name Erpenn, which Macalister suggests is a hybrid of the Pictish name Erp and the Irish diminuitive -én. One other interesting feature of the Ogham transcription of non-Irish names is exhibited by the St Dogwell's stone (SDOGW/1), where the name written in the Latin script as HOGTIVIS is written in the Ogham script as OGTEN[AS]. The language and derivation of the name Hogtivis is obscure, but it cannot be Goidelic. In writing the name Hogtivis in Ogham letters, the initial H has been dropped, which confirms that the Ogham letter uath ᚆ, which in later medieval Irish tradition is used to represent the Latin letter H, but which does not occur in Ogham inscriptions on memorial stones, was not used to represent the /h/ sound at this time. Exactly what the original phonetic value of this letter was is unknown ([y] has been suggested), but it had become obsolete by the time that Primitive Irish came to be inscribed on memorial stones in the 4th to 6th centuries. Site Penseiri Farm, Trecastell, Llanfaelog, Anglesey. Current Location In an outbuilding north of the farmhouse (the barn having been demolished in 2001). History Found in 1802 in a field, then used as the lintel for a window in a nearby barn. Description Rectangular slab with vertical Latin inscription on one face, and an Ogham inscription along one edge. Notes This stone is marked as an Ogham stone on the Ordnance Survey Map of Britain in the Dark Ages, but no Ogham inscription is noted in the CISP database or appears to have been published elsewhere. When the stone was examined by Professor Nancy Edwards in 2007 she noticed the remnants of a previously unrecorded Ogham inscription on the stone (my thanks to Professor Edwards for kindly providing me with details of the stone and its inscriptions in advance of its publication in the forthcoming third volume of A Corpus of Early Medieval Inscribed Stones and Stone Sculpture in Wales covering North Wales). Current Location Inside St David's Church, Llywel. History Found in 1954 by Canon Jones-Davies in a wall/hedge blocking an old trackway by the River Usk. Description Sandstone pillar stone with a vertical Latin inscription on one face, and an Ogham inscription along the left edge. Dimensions 1.82 × 0.33 × 0.22 m.
Notes The Ogham inscription cuts across the Latin inscription where the stone has been chamfered, indicating that the Ogham inscription postdates the Latin inscription. Site Ty-yn-y-wlad Farm, Crickhowell, Powys. Current Location Brecknock Museum & Art Gallery, Brecon [Cast No. 06.482]. History Found in 1774 by the side of a field. Description Pillar stone with a vertical Latin inscription in three lines on one face, and an Ogham inscription along the left edge. Dimensions 1.98 × 0.53 × 0.18 m.
Notes Macalister reads as TURPILI MOSAC TRALLONI "Of Turpilus, boy (=attendant) of Trallonus". Site St Cynog's Church, Defynnog, Maescar, Powys. History Discovered in 1853, at which time it was built into the external face of the church tower. Description Sandstone pillar stone with a vertical Latin inscription in two lines on one face, an uncertain Ogham inscription along the right edge, and an engraved cross at one end. Dimensions 1.68 × 0.25 × 0.15 m.
Notes The reading of the Ogham inscription is uncertain, as only a few isolated strokes of the original inscription remain. "Ogham, almost all of which was trimmed away by the masons. Only the tips of three letters lying upon the H-surface remain" (Macalister 1945 p.318). "Possible vestiges of Ogams appear on the r. angle of the face" (Nash-Williams 1950 p.69). The cross was probably added later, changing the original orientation of the stone. Site Pentre Poeth Farm, Capel Llanilid, Trecastle, Powys. Current Location British Museum (G41) [1878,1102.1]. History Found in 1878 in rough farmland. Description Sandstone pillar stone with a vertical Latin inscription on one face, and an Ogham inscription along the right edge. Notes The stone is richly decorated on the reverse (click on the image to see both sides of the stone), but these decorations were probably added later, and are upsidedown with respect to the original orientation of the stone. Notes This is the reading of Nash-Williams 1950. Macalister 1945 reads MAQITRENI instead of MAQUTRENI. Site Pentre Goch Garreg, Crai, Brecknock, Powys. History First recorded in 1698 by Edward Lhuyd. Description Pillar stone with a vertical Latin inscription in two lines on one face, and an Ogham inscription along the left edge. Dimensions 3.20 × 0.30 × 0.15 m.
Notes This stone is only known from a 1698 drawing by Edward Lhuyd, who was unaware at the time that the marks along the edge of the stone were Ogham letters (it was not until 1702–1707 that Lhuyd recognised the marks on the edge of EMLGE/1 as an alphabetic inscription, but even then he did not realise that they were Ogham ["Several Observations Relating to the Antiquities and Natural History of Ireland"; in Philosophical Transactions of the Royal Society of London vol.27 (1710) pp.503–506]). The Ogham inscription as drawn by Lhuyd cannot be meaningfully interpretted. Current Location In situ ? Notes Marked as an Ogham stone on the Ordnance Survey Map of Britain in the Dark Ages, but there appears to be no entry for this stone in the CISP database. Site St David's Church, Trallwng (Trallong), Brecknock, Powys. Current Location Inside the new St David's Church, Trallong. History Discovered in 1856, at which time it was being used as the lintel for a window in the old church. Description Sandstone pillar stone with a vertical Latin inscription in two lines on one face, and Ogham inscription along the left edge, and an engraved cross at one end. Dimensions 1.75 × 0.36 × 0.13 m.
Notes The cross was added later, changing the original orientation of the stone. Notes The latter part of the inscription is problematic, and several different interpretations have been offered. Site Ystrad mountain, Pontsticill, Merthyr Tydfil. Current Location In Cwm Criban valley below Ystrad mountain (rediscovered by Webley in 1957). History Discovered in 1694 on Ystrad mountain (according to Edward Lhuyd). Description Pillar stone with a faint Latin inscription on one face, and an Ogham inscription along the left edge. Dimensions 1.65 × 0.35 × 0.30 m.
Site Pen-y-Mynydd, Ystradfellte, Caer Madoc, Powys. Current Location Cyfarthfa Castle Musuem & Art Gallery, Merthyr Tydfil, Glamorgan. History Discovered in 1789 on open moorland. Description Pillar stone with an Ogham inscription along the left edge, and an engraved cross at one end. Dimensions 1.88 × 0.25 × 0.25 m.
Current Location In situ (near the road from Ystradfellte to Heol Senni). Description Pillar stone with no visible inscriptions or marks. Notes This stone is marked as an Ogham stone on the Ordnance Survey Map of Britain in the Dark Ages, but there appears to be no entry for this stone in the CISP database. Site Llystyngwyn Farm, Brynkir, Dolbenmaen, Gwynedd. Current Location Farmyard of Llystyngwyn Farm. History Discovered in 1902 near a gap in a hedge, 200 m. from a Roman road. Description Granite slab with a horizontal Latin inscription in three lines, and an Ogham inscription along the right edge. Dimensions 1.02 × 1.09 × 0.36 m.
Site St Michael's Church, Treflys, Gwynedd. Current Location Inside the church. History Discovered in 1904 in the foundation of the western wall of the churchyard. Description Slate pillar stone with a chi-rho cross and Latin inscription on one face. Dimensions 1.33 × 0.36 × 0.20 m.
Notes No Ogham inscription is now visible, but Macalister 1945 notes that the left hand edge has been chipped, "as though to destroy an Ogham". Site St David's Church, Llanarth, Ceredigion. History Found in 1808 in the churchyard. Description Cross stone with a damaged Latin inscription running vertically down the shaft of the cross, and a doubtful Ogham inscription along the left edge. Dimensions 1.47 × 0.61 × 0.25 m.
Notes The Ogham inscription is doubtful, and only legible to Macalister. "Apparently the artist of the cross did not notice his predecessor's work till he had completed his task, and when he did so, cautiously chipped it away, taking care not to spoil his own handiwork. He was obliged to spare the final S, which lay upon the arm of the cross, to avoid spoiling the latter with an unsightly flake. The work of destruction has not been complete: his carefulness has forced him to leave tips of scores along the B-surface: an R, an N (possibly), and L and a G can thus be traced; indeed, the second score of the last letter can be followed almost throughout its length. Restoring the vowels by the interspaces, and supplying an inevitable initial T, we arrive at TRENALUGOS as the most probable restoration" (Macalister 1945 p.333). "On the edge of the left arm-end what appear to be ogam strokes cannot be earlier than the cross and are likely to be strokes made by sharpening tools or weapons" (Thomas 1994 p.417). Notes This is Macalister's restoration. Site St Tysul's Church, Llandysul, Ceredigion. Current Location Inside the church (set into the north wall of the vestry). History Discovered in 1703 in the wall of the churchyard. Description Broken piece of pillar stone with a vertical Latin inscription in three lines on one face, and a doubtful Ogham inscription on the left edge. Dimensions 0.44 × 0.36 m.
Notes The broken upper portion of a pillar stone. The Ogham inscription is doubtful, and has only been recognised by Macalister. "The surviving traces—mere distal tips of the scores—of the Ogham suggest a V and an R, probably relics of the name [VEL]V[O]R[IGES]" (Macalister 1945 p.335). Site Crug y Wyl Farm, Rhyddlan, Llanwenog, Ceredigion. History Discovered in 1808 in the foundations of the ruins of Capel Wyl. Description Rectangular pillar stone with a vertical Latin inscription in three lines on one face, and an Ogham inscription along the left and top edges. Dimensions 1.78 × 0.36 × 0.20 m.
Site Castell Dwyran, Cilymaenllwyd, Carmarthenshire. History Discovered in 1895 in the churchyard fence. Description Pillar stone with an engraved cross and a horizontal Latin inscription in three lines on one face, and an Ogham inscription along the left and top edge. Dimensions 2.11 × 0.61 × 0.30 m.
Notes VOTEPORIGIS/VOTECORIGAS has long been identified with Vortipor, a 6th-century king of Dyfed mentioned by Gildas, but recent scholarship tends to reject this identification on the basis that the lack of an R in the first syllable of the name in both the Ogham and Latin inscriptions cannot be reconciled with the spelling of the name given in historic sources. Site St Margaret's Church, Eglwyscummin, Carmarthenshire. History Discovered in 1889 in the churchyard at which time it was being used as a step on the south side of the church. Description Sandstone pillar stone with a vertical Latin inscription in two lines on one face, and an Ogham inscription on the left and right edges. The top of the stone is broken off and missing. Dimensions 1.02 × 0.33 × 0.25 m.
Site St Odoceus' Church, Llandawke, Carmarthenshire. History Discovered in 1838 in the churchyard. Description Pillar stone with a vertical Latin inscription in two lines on one face and one line on the left side, and an Ogham inscription along the left and right edges. Dimensions 1.37 × 0.30 × 0.08 m.
Site Capel Mair, Llangeler, Carmarthenshire. Current Location Inside the chapel. History Discoverd in 1828 in the chapel cemetery. Description Gritstone pillarstone with a vertical Latin inscription in two lines on one face, and an Ogham inscription along the right and top edges. Dimensions 1.05 × 0.46 × 0.10 m.
Notes The inscription is extremely uncertain, and a number of different readings have been made. The reading above is based on Macalister 1945. Site All Saints Church, Llansaint, St Ishmael's (Llan Ishmael), Carmarthenshire. History Discovered in 1846, at which time it was built into the external wall of the church. Description Pillar stone with a vertical Latin inscription in two lines on one face. The edges of the stone have been flaked away. Dimensions 1.47 × 0.27 m.
Notes The Ogham inscription is very doubtful. According to Macalister the sides and tops of the stone have been flaked away in order destroy an original Ogham inscription, of which he sees the remnant strokes of a single letter. Site Llanwinio Church, Llanwinio, Carmarthenshire. Current Location Carmarthen Museum, Cast at National Museum of Wales [14.306/5], Cardiff. History Discovered in 1846 whilst digging the foundations of the new church at Llanwinio Carn. Description Pillar stone with a vertical Latin inscription in three lines on one face, an Ogham inscription on the left and right edges, and an engraved cross at one end. The top of the stone is broken off and missing. Dimensions 1.19 × 0.38 × 0.29 m.
Notes The cross was probably added later, changing the original orientation of the stone. Macalister 1945 suggests that there would have been a third line of Ogham on the third edge of the stone, which is now broken off. Site Parciau House, Henllan Amgoed, Carmarthenshire. Current Location In Situ (but moved to an adjacent field). History Found in 1697 in a field called Parc y Maen ("Field of the Stone"). Description Pillar stone with a vertical Latin inscription in two lines on one face. Dimensions 1.60 × 0.53 × 0.33 m.
Notes The Ogham inscription is doubtful. "At best, for the greater part of its length, it is recognizable only by the hollows which the groups of letter-scores have left on the two sides of the angle" (Macalister 1945 pp.348-349). Current Location National Museum of Wales [36.473], Cardiff. History Found in 1693 on the summit of a burial mound called Bryn-y-Beddau ("Hill of the Graves"). Description Sandstone pillar stone with a horizontal Latin inscription on one face, and an Ogham inscription on the left and right edges. Dimensions 2.00 × 0.64 × 0.58 m.
Site Ty'n y bryn Farm, Dol tre beddau, Pentrefoelas, Conwy. History Discovered in 1820, lining a grave in a cemetery of forty graves under Ty'n y bryn Farm. Description Pillar stone with a vertical Latin inscription in three lines on one face. Dimensions 1.52 × 0.52 × 0.08 m.
Notes The Ogham inscription is doubtful, and has only been recognised by Macalister. Site Capel Brithdir, Bargoed, Gelli-gaer, Tirphil, Caerphilly. Current Location National Museum of Wales [23.283], Cardiff. History Found in 1861 in a field next to Capel Brithdir. Description Sandstone pillar stone with a vertical Latin inscription in four lines on one face. Dimensions 2.25 × 1.00 × 0.22 m.
Notes The Ogham inscription is doubtful, and has only been recognised by Macalister. "There are no oghamic marks whatever upon the edges" (Jones 1862 p.220). "The suggestion that there are traces of Ogam cannot be maintained" (Royal Commission on Ancient and Historical Monuments in Wales 1976 p.36). Current Location Margam Stones Museum [no. 2], Port Talbot. History Discovered in 1578 by the side of the road between Eglwys Nynnydd and Pyle Station. Description Sandstone pillar stone with a vertical Latin inscription in two lines on one face, and an Ogham inscription on the left and right edges. Dimensions 1.35 × 0.52 × 0.35 m.
Notes Macalister reads two separate inscriptions, PAMPES (corresponding to the Latin PVMPEIVS) and ROL[ACU]N M[A]Q ILLUNA. Site Margam Mountain (Mynydd Margam), Margam, Neath Port Talbot. Current Location Margam Stones Museum [no. 3], Port Talbot. History Discovered in 1695 on Margam Mountain, near a pool called Llyn-dwr-mawr. Description Pillar stone with a vertical Latin inscription in four lines on one face, and an engraved Maltese cross on the top. Dimensions 1.01 × 0.33 × 0.22 m.
Notes Marked as an Ogham stone on the Ordnance Survey Map of Britain in the Dark Ages, but no Ogham inscription is noted in the CISP database. Site Loughor Rectory, Loughor, Swansea. Current Location Swansea Museum [SWASM:SM1952.11]. History Discovered in 1857 in Loughor Rectory garden, at which time it was being used as a step leading up to the house. Description Sandstone Roman altar stone with a fragmentary Ogham inscription along one edge of the base. Dimensions 1.10 × 0.53 × 0.53 m.
Notes Macalister reads the name as G[R]AVICA. Site Cas Wilia (Castell Villia) Farm, Brawdy, Pembrokeshire. Current Location Inside the Church porch, Brawdy church. History Discovered in 1883, at which time it was being used as a gatepost. Description Irregularly shaped pillar stone with an Ogham inscription along one edge. Dimensions 2.69 × 0.84 × 0.56 m.
Current Location Inside the Church porch, St David's Church, Brawdy. History Discovered in 1680, at which time it was being used as a footbridge over a stream. Dimensions 2.06 × 0.53 × 0.38 m.
Site St David's Church, Bridell, Pembrokeshire. History Discovered in 1860 in the churchyard. Description Pointed pillar stone with an engraved cross on one face, and an Ogham inscription along the left edge. Dimensions 2.29 × 0.66 × 0.17 m.
Notes This is the reading given by Thomas 1994. Macalister 1945 and Nash-Williams 1950 give slightly different readings, NETTASAGRI MAQI MUCOE BRIACI and NETTASAGRU MAQI MUCOI BRECI respectively. Site Caldey Priory, Caldey Island (Ynys Byr), Penally, Pembrokeshire. Current Location Inside the restored priory chapel, Caldey Island. History Discovered in 1810 in the ruins of the old priory. Description Sandstone pillar stone with a horizontal Latin inscription in eight lines on one face, an Ogham inscription on the left and right edges, and an engraved cross on each of the four faces. Dimensions 1.73 × 0.41 × 0.10 m.
Notes This is the reading given by Nash-Williams 1950. Macalister reads the letters on the right edge as QI instead of INB. Site St Llawddog's Church, Cilgerran, Pembrokeshire. History Discovered in 1855 in the churchyard, at the south side of the church. Description Pillar stone with a vertical Latin inscription in two lines on one face, and an Ogham inscription along the right edge. Dimensions 1.50 × 0.34 × 0.34 m.
Site St Clydey's Church, Clydau (Clydaï), Pembrokeshire. History Discovered in 1860 in the north wall of the churchyard. Description Pillar stone with a vertical Latin inscription in one line on one face, and an Ogham inscriptuion along the left and right edges. The top of the stone has been trimmed away to make a base for a sundial, losing part of he Ogham inscription. Dimensions 1.79 × 0.33 × 0.25 m.
History Discovered in 1698 in the churchyard. Description Pillar stone with a vertical Latin inscription in two lines on one face, an Ogham inscription along the right edge, and an engraved cross at one end. Dimensions 1.47 × 0.41 × 0.13 m.
Notes This is the reading given by Nash-Williams 1950. Macalister 1945 reads DOVATACIS. Site Llangwarren House, Jordanston, Pembrokeshire. Current Location Built into the external corner of a stable adjoining Llangwarren House. History Discovered in 1896 on the Llangwarren farm, at which time it was being used as a gatepost. Dimensions 1.45 × 0.58 × 0.25 m.
Site St Teilo's Church, Llandeilo (Llandilo), Maenclochog, Pembrokeshire. Current Location By the gateway to the churchyard of the now ruined St Teilo's Church. History Discovered in 1889 inside the church. Description Pillar stone with a vertical Latin inscription in two lines on one face, an Ogham inscription along the left edge, and an engraved cross at one end. Dimensions 1.73 × 0.46 × 0.18 m.
Notes The unusual MACV for MAQI is read as macu by Thomas 1994. Site Trehowel Farm, Mynydd Stambar, Llanfrynach, Pembrokeshire. Current Location In the graveyard of Glandwr Baptist Chapel. History Discovered in 1908 near Trehowel farmhouse, at which time it was being used as a gatepost. Description Pillar stone with an engraved cross on one face, and an Ogham inscription along the right edge. Dimensions 1.45 × 0.32 × 0.35 m.
Notes This is the reading given in Nash-Williams 1950. Macalister 1945 reads the inscriptions as INg[E]NS[A]Ng[KT]ASEGNI (=INGEN SANGKTA SEGNI) "The sainted daughter of Segne". Site Mathry Church, Mathry, Pembrokeshire. Current Location Inside the church porch. Description Pillar stone with a horizontal Latin inscription in four lines on one face. Dimensions 1.35 × 0.43 × 0.18 m.
Notes The Ogham inscription is uncertain. "Mutilated traces of Ogams" (Nash-Williams 1937 p.386); "Illegible ogam" (Jackson 1953 p.140). Site St Brynach's Church, Nevern, Pembrokeshire. Current Location Inside the church (built into the sill of the east window in the south wall). History Discovered in 1904 inside the church, at which time it was being used as a lintel. Description Pillar stone with a vertical Latin inscription in one line on one side, and an Ogham inscription along the left and top edges. Dimensions 1.59 × 0.33 × 0.10 m.
Current Location In the churchyard (near the south wall of the nave). History Discovered in 1695 in the churchyard on the north side of the church. Description Pillar stone with a horizontal Latin inscription in two lines on one face, and an Ogham inscription along the left edge. Dimensions 1.93 × 0.61 × 0.51 m.
Site St Dogmaels Abbey, St Dogmaels, Pembrokeshire. Current Location Inside St Thomas's Church. History Discovered in 1694, at which time it was being used as footbridge over a brook in the grounds of the abbey. Description Gritstone pillar stone with a vertical Latin inscription in two lines on one face, and an Ogham inscriptin along the left edge. Dimensions 2.13 × 0.48 × 0.20 m.
Site Little Trefgarne (Trefgarn Fach) Farm, St Dogwell's, Pembrokeshire. Current Location In the churchyard at St Dogwell's Church. History Found in 1875, at which tie it was being used as a gatepost on the road leading to the farm. Description Irregularly shaped pillar stone with a vertical Latin inscription in two lines on one face, and an Ogham inscription along the right edge. Dimensions 1.85 × 0.53 × 0.23 m.
Notes This is the reading of Macalister 1945 and Thomas 1994. Rhys 1918 and Nash-Williams 1950 give the reading OGTEN[LO]. Site St Mary's Church, Spittal, Pembrokeshire. Current Location In the porch of St Mary's Church. History Discovered in 1861 in the churchyard at the east side of the south porch. 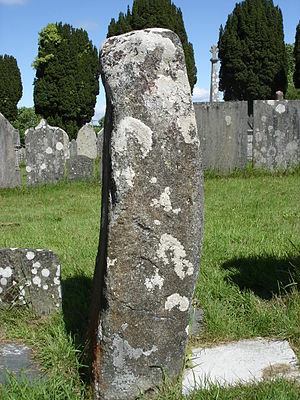 Dimensions 1.47 × 0.53 × 0.46 m.
Notes Information about the stone in situ states that originally there were both Latin and Ogham inscriptions on it, but the Ogham letters are no longer visible. However, neither the CISP database nor the Ordnance Survey Map of Britain in the Dark Ages indicate an Ogham inscription on this stone. Site Church of St Peter and St Cewydd, Steynton, Pembrokeshire. History Found 1875 or earlier, and used as a gravestone in the churchyard (near the south-east end of the church) from 1875. Ogham inscription first recognised in 1880. Description Pillar stone with an engraved cross on one face, and an Ogham inscription along the left edge. Dimensions 1.24 × 0.51 × 0.27 m.
Notes Used as a gravestone in Victorian times, with an epitaph to T. Harries (died 30 January 1875) who reputedly found the stone. CISP : Celtic Inscribed Stones Project. Department of History and the Institute of Archaeology, University College London. NMR : National Monuments Records. English Heritage. Brash 1869 : Richard Rolt Brash, "The Ogham Inscribed Stones of Wales"; in Archæologia Cambrensis‎ 3rd series vol.15 (1869) pages 148–167. Ferguson 1887 : Samuel Ferguson, Ogham Inscriptions in Ireland, Wales, and Scotland. Edinburgh, 1887. Jackson 1953 : K. H. Jackson, Language and History in Early Britain. Edinburgh: Edinburgh University Press, 1953. Macalister 1945 : R. A. S. Macalister, Corpus Inscriptionum Insularum Celticarum Vol. I. Dublin: Stationery Office, 1945. Nash-Williams 1950 : V. E. Nash-Williams, The Early Christian Monuments of Wales. Cardiff: University of Wales Press, 1950. Okasha 1993 : Elisabeth Okasha, Corpus of Early Christian Inscribed Stones of South-west Britain. Leicester: Leicester University Press, 1993. Thomas 1994 : Charles Thomas, And Shall These Mute Stones Speak? Post-Roman Inscriptions in Western Britain. Cardiff, 1994. Lloyd Laing, The Archaeology of Late Celtic Britain and Ireland, c. 400–1200 AD. Methuen, 1975. Patrick Sims-Williams, The Celtic Inscriptions of Britain: Phonology And Chronology, c.400-1200. Wiley-Blackwell, 2003. Nancy Edwards, Early-Medieval Inscribed Stones and Stone Sculpture in Wales: Context and Function; in Journal of Medieval Archaeology vol. 45 (2001) pp.15–39. A Corpus of Early Medieval Inscribed Stones and Stone Sculpture in Wales University of Wales Press, 2007 (Vols. I and II) and forthcoming (Vol.III). ᚃ Fearn F Read as F or V.
ᚇ Dair D Variants include 'Rabbit-eared D'. ᚍ nGéadal W Read as Ng or Gw. ᚎ Straif Z Read as Z or St.
ᚏ Ruis R Double R is occasionally written as a crosshatched ligature. ᚐ Ailm A Variants include 'Hammerhead A' and 'S-shaped A'. ᚕ Eabhadh X Read as É or K.
ᚘ Ifin P Written as a single cross under the stemline in epigraphic texts. ᚙ Eamhancholl Not found in epigraphic texts. This page is best viewed if the set of 12 BabelStone Ogham fonts are installed on your system. In order to see the Latin Epigraphic Letter Sideways I (ꟷ) it is recommended to install the BabelStone Roman font or the Doulos SIL font (version 5.000 or later). An excellent site, well designed, most helpful and much appreciated. For the references, may I also recommend Damian McManus' "A Guide to Ogam" [Publisher: An Sagart; ISBN-10: 1870684753; ISBN-13: 978-1870684750] for your consideration? The author is much cited, in fact, by Charles Thomas, already appearing in your list.